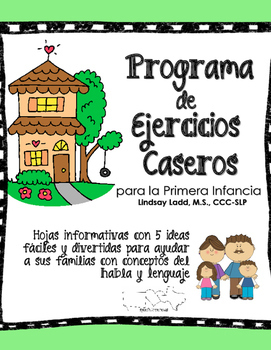 This 22-page .pdf includes parent/caregiver hand-outs in both Spanish and English for EIGHT common goal areas for preschool and early receptive/expressive language skills! Also includes a HEP Data Log that can be filled out by you and the caregiver on a session-by-session basis to track weekly HEP implementation. Simply circle or highlight your suggested activities or fill in your own on the HEP Data Log to make HEP implementation a breeze. 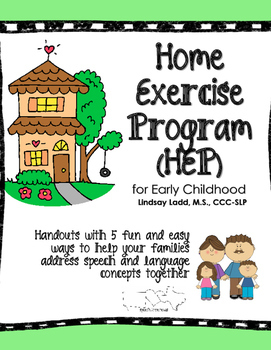 If you previously downloaded my "Home Exercise Program Hand-Outs for Early Childhood" (which is in English-only), please RE-DOWNLOAD for purchase to receive ALL 4 NEW, UPDATED HANDOUTS which have been added to the packet. 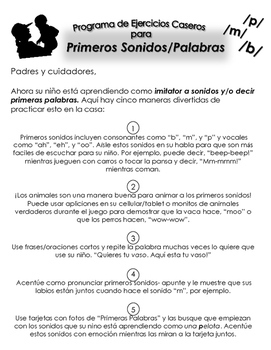 Please note that while some suggestions within the handouts may be similar, these updated handouts are a completely different style and made to be easier to read and easier on your printer. 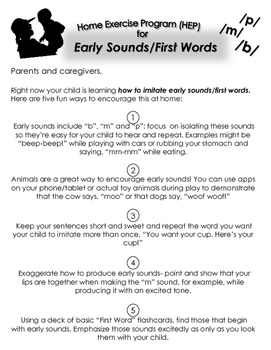 They also give more clear-cut and simple suggestions written in parent-friendly language. As always, thanks for stopping by and I would love to hear if you found this product helpful in your own therapy practice!